IHG® Rewards Club - eBooks - S.H.A.P.E. Rick Warren's bestselling book The Purpose Driven(R) Life describes God's five purposes for every Christian. Now Erik Rees helps you discover God's unique purpose for your life based on the way God has shaped you. He made you marvelously unique for a reason. Tap into that reason and into the secrets of your own deeply personal makeup-the remarkable ensemble of passions, talents, experiences, tempe… rament, and spiritual gifts that work together to make you who you are-and you'll discover the path to a life of unimagined purpose, impact, and fulfillment.In this eye-opening, empowering, and liberating book, Rees shows you how to uncover God's most powerful and effective means of advancing his kingdom on earth: your own irreplaceable, richly detailed personal design. 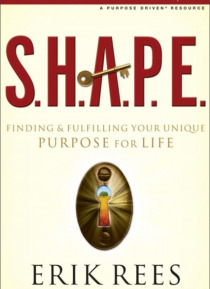 Based on the purpose of ministry outlined in The Purpose Driven Life, this inspiring guidebook gives you the tools to:Unlock your God-given potential Uncover your specific Kingdom Purpose Unfold a kingdom plan for your life Filled with Scripture and real-life stories, S.H.A.P.E. presents a series of challenges that will guide you through the process of discovering your personal blend of Spiritual Gifts: A set of special abilities that God has given you to share his love and serve others.Heart: The special passions God has given you so that you can glorify him on earth.Abilities: The set of talents God gave you when you were born, which he also wants you to use to make an impact for him.Personality: The special way God wired you to navigate life and fulfill your unique Kingdom Purpose.Experiences: Those parts of your past, both positive and painful, which God intends to use in great ways.It's all here: insights that can change the way you look at yourself and how you live your life and practical guidance for applying them. Discover how to apply your amazing array of personal attributes in ways that bring confidence, freedom, clarity, and significance that can only come from your Creator.